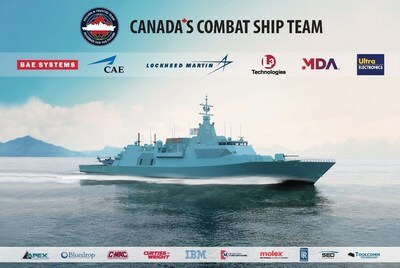 OTTAWA, Ontario, Feb. 8, 2019 /PRNewswire/ -- Canadian technology, experience and infrastructure proved a winning combination for Canada's new fleet of surface combatants, as Canada's Combat Ship Team has been awarded the Canadian Surface Combatant design contract by Irving Shipbuilding. Irving Shipbuilding is the Canadian Surface Combatant prime contractor and will build all 15 ships at Halifax Shipyard. BAE Systems is a world leading shipbuilding, support and maintenance company with the skills and expertise to design, build, integrate, test, commission and support complex warships. BAE Systems has a strong track record of collaboration with customers and industrial partners worldwide to share technology and skills – helping countries grow their naval and industrial capabilities. Canadian industry is already integral to the Type 26 Global Combat Ship program. BAE Systems has operated in Canada for over 100 years partnering over a recent period with over 240 Canadian companies. BAE is active across Canada with equipment including Hawk trainer jets, Submarines, cyber security, Hybrid drive busses, and naval guns. Lockheed Martin Canada has been Canada's trusted defence partner for nearly 80 years and has a proud legacy of providing innovative naval systems and sustainment solutions for Canada and abroad. For more than three decades, Lockheed Martin Canada has demonstrated its capability and commitment to the Royal Canadian Navy as the Prime Contractor and Combat System Integrator for the HALIFAX Class Frigates. The company employs approximately 1,000 employees at major facilities in Ottawa, Montreal, Halifax, Calgary, and Victoria, working on a wide range of major programs spanning the aerospace, defence and commercial sectors. MDA is an internationally recognized leader in space robotics, space sensors, satellite payloads, antennas and subsystems, surveillance and intelligence systems, defence and maritime systems, and geospatial radar imagery. MDA's extensive space expertise and heritage translates into mission-critical defence and commercial applications that include multi-platform command, control and surveillance systems, aeronautical information systems, land administration systems and terrestrial robotics. MDA is also a leading supplier of actionable mission-critical information and insights derived from multiple data sources. Founded in 1969, MDA is recognized as one of Canada's most successful technology ventures with locations in Richmond, Ottawa, Brampton, Montreal, Halifax and the United Kingdom. MDA has supported the Royal Canadian Navy for over two decades. Based in Dartmouth, Nova Scotia, Ultra Electronics is a part of the Ultra Electronics Group, an international defense and aerospace company. Ultra Electronics has been delivering world-leading underwater warfare solutions to the defense market for 70 years. Ultra Electronics has been highly successful in transforming its research investment into the technologically-advanced underwater battlespace sensor systems that it delivers to both Royal Canadian Navy and internationally. Today, Ultra Electronics is recognized worldwide for its expertise in hull mounted sonar, towed active and passive arrays, sonar sensors, and underwater acoustics. Rolls-Royce pioneers cutting edge technology to provide highly-efficient integrated power and propulsion solutions. Rolls-Royce has been established in Canada for over 70 years and today employs over 1500 Canadians at eight locations across six provinces. Rolls-Royce plays an active role in many of the world's major defence programs offering advanced system solutions to navies and coastguards.